TOWSON, MD. – Purple-faced Aster carries a flower and wears a big white spacesuit. Larry, who is blue and triangular, seems to live in a tree stump. Orange Mike, with his long arms and legs, loves to have fun. And you will want to spend time with all three of them and their friends. Aster, Larry, and Mike are the stars of “Aster,” the first animated series to air on BCPS-TV. The show, created by Kasra Kaviani, a 2015 graduate of Parkville High School and a student at the Community College of Baltimore County, can be seen now at https://vimeo.com/207182093. It will have its broadcast debut Wednesday, March 15, at about 4:25 p.m. just before “Math Homework Helpers.” BCPS-TV can be found on Comcast Cable Channel 73 and Verizon FiOS Channel 34 in Baltimore County. Written, storyboarded, and drawn and inked frame-by-frame by Kaviani, the six-episode series follows the adventures of Aster as he seeks water and oxygen for his flower. The episodes explore this new world and characters and gently offer humorous life lessons. 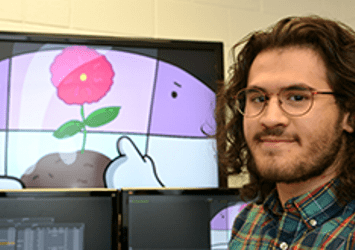 The show’s theme song was written by BCPS-TV intern Isabella Maxey of Eastern Technical High School, and several of the characters are voiced by another BCPS alumnus, Michael Paradiso of George Washington Carver Center for Arts and Technology. For more about Kaviani and the creation of the show, please visit http://www.bcps.org/news/2017/0306a/.